Many years ago, I was lucky enough to be an apprentice in the Department of Ancient Near East in the Metropolitan Museum of Art in New York. The ANE department was the smallest in the museum and full of friendly people who were generous with their time and attention. 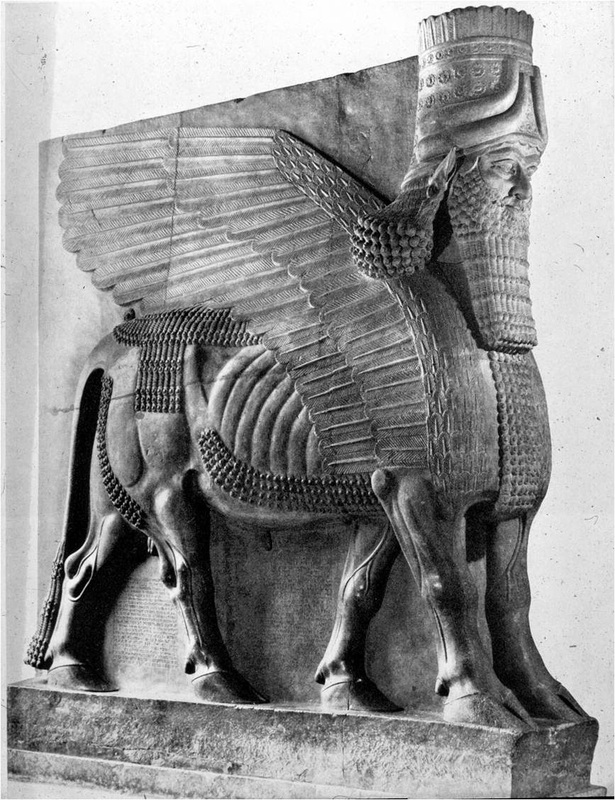 They were responsible for the statues of the Lamassu from the Citadel of King Sargon II in Assyria, (modern day Iraq), and other magnificent sculptures, in addition to hundreds of cylinder seals and thousands of cuneiform tablets. During my time in the Museum, I most enjoyed walking around the galleries on Mondays when it was closed to the public. In the emptiness and silence, the objects seemed to regain some of the power that they had lost when they were excavated and hauled thousands of miles away from their context. At the time I didn’t pay much attention to individual objects. I was too overwhelmed by the quantity of beautiful and astonishing things. 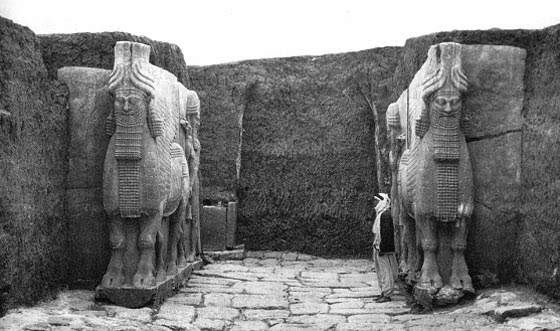 It was only recently that I started to think about the Lamassu and to connect them to other guardians of gates and doorways, and to explore the ways cultures have sought to control that space in between, which is neither one place nor another. These liminal spaces are where archaeologists often find ritual burials, of people, animals or things, known as ‘spiritual middens’. Doorways, windows, roofs and the space under floors are all places where it was believed bad spirits or forces may gain entry into a house, and therefore, a family. 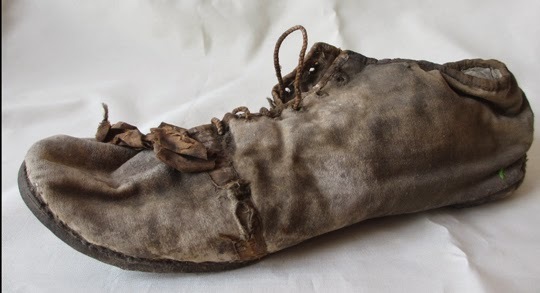 Shoes are often found buried in old houses, particularly in Britain and Northern Europe. This practice only died out in the early-mid 20th century. As shoes appear similar to a container, and because they are uniquely shaped by the foot that wore them, they were believed to have the power to capture witches and evil spirits. At the other end of the spectrum, thousands of years ago the Lamassu were set at the most important gate of the most powerful cities. They had five feet so that they could appear to be standing from the front and walking from the side. Their bodies could be either that of an ox or a lion. For hundreds of years they expressed ultimate power in four different kinds of beings, MAN (bearded, like so many men of today) the creator, the LION, king of the wild beasts, the OX, the most powerful domestic animal, and the EAGLE, lord of the air. It is very interesting to note that this iconography was used in the Old Testament regarding the creatures around the throne of God in Ezekiel Chapter 1 and also in the New Testament in Revelation, and that these four beings were subsequently taken as the symbols for the four evangelists, Matthew (man) Mark (lion) Luke (ox) and John (eagle). The Romans, ever attentive to detail, had the goddess Cardea, who looked after door hinges. Rather a small job, and some people sniffed at it even then, but others believed that Cardea guarded the door between this world and the other world, and that she could open things that had been shut and close things that had been open. This poem came as a surprise, through one of those open doors. or the path that unwinds in a wood. where buried shoes keep the border patrol.